A bride has a million opportunities to show off her POV during the day (or weekend) of celebrations, but let's be honest, most of that self-expression usually boils down to the gown. We're here to beg you to reconsider. After all, of your entire wedding day ensemble, your dress is probably the one piece you'll never wear again… so, why spend so much energy and money on it? In our opinion, it's the shoes and accessories that will really make your outfit. With that in mind, styling around one great, under-$1,000 dress, we've come up with three very different wedding-day outfits made up of accessories you'll want to wear time and again, for a little cost-per-wear (and sentimental) value. Kate Middleton's wedding was kind of the best thing ever, and you're looking to elicit a little jaw-dropping of your own. Don't go for all-white shoes or too-precious accessories. 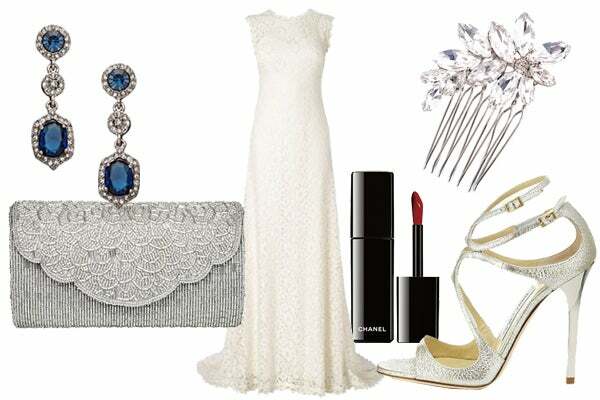 Choose a shoe, earrings, and a clutch that you'll be able to wear out again — perhaps to your best friend's wedding? Carolee Blue Drop Earrings, $45, available at Max&Chloe; Dune Magical Beaded Handbag, $86.98, available at John Lewis; Phase Eight Maria Wedding Dress, $775, available at House of Fraser; Chanel Rouge Allure Laquer, $32, available at Chanel; J. Crew Mini Jeweled Flower Comb, $68, available at J. Crew; Jimmy Choo Lance Heels, $695, available at Jimmy Choo. You're more likely to get married in your backyard than in a giant cathedral, so make sure your wedding look says "I love ya!" instead of "And now we will wed." Glittery flats keep things pretty but laid-back, and that floral crown can definitely be worn again — during your annual Coachella love romp, for starters. 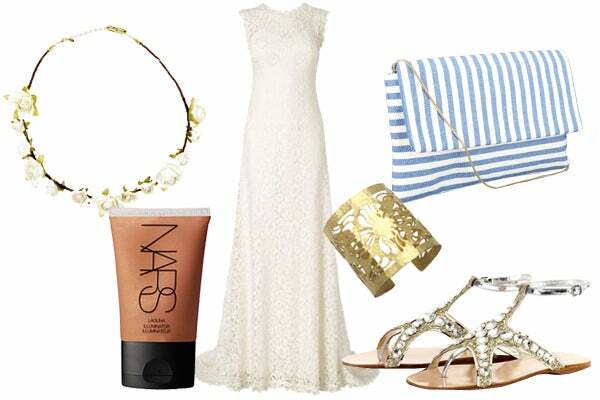 Cult Gaia White Paper Rose Crown, $75, available at Cult Gaia; Nars Laguna Illuminator, $30, available at Nars; Phase Eight Maria Wedding Dress, $775, available at House of Fraser; Steve Mono Sara L2 Clutch, $148, available at Farfetch; Wendy Mink Floral Hammered Cuff, $223, available at Charm & Chain; Miu Miu Glitter Embellished Leather Sandal, $691, available at MyTheresa. This is your chance — and excuse — to splurge on those high-fashion pieces you've always wanted. Get creative with your nail art and make sure your statement necklace shouts so loud even your weird cousin Steven who's in the last pew can hear it. Alexander McQueen Wave Skull Choker Necklace, $1,919, available at Matches; Jimmy Choo Grain Metallic Ankle Boots, $260.50, available at Pret-a-Beaute; Models Own Beetlejuice Nail Polish, $10, available at Urban Outfitters; Phase Eight Maria Wedding Dress, $775, available at House of Fraser; Jane Tran Amethyst Crystal Bobby Set, $50, available at Zappos; DVF Carolina Lip Clutch, $345, available at DVF.